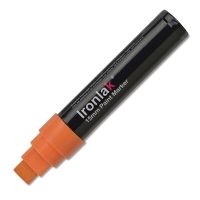 Ironlak Pump Action Paint Markers are superior-quality, adjustable-output paint markers for use across a wide range of surfaces and techniques. Perfect for working in spaces both small and large, they can be used on canvas, paper, fabric, glass, porcelain, steel, terra cotta, skateboard decks, and everything in between. Every marker contains professional-quality, waterbased acrylic paint with a heavy pigment load but a smaller pigment particle, for optimum coverage. A high-quality resin allows the paint to flow smoothly — while creating a film that protects your work when exposed to the elements, and adding elasticity that’s crucial on surfaces prone to expansion and contraction. The paint is odorless, opaque, permanent, and lightfast. A proprietary valve system allows for controlled output, making Ironlak Paint Markers ideal for making broad strokes or adding fine details. Press firmly for free-flowing applications, and lightly to make controlled strokes. The barrels are made from polypropylene plastic for a durable, solvent-resistant marker that won’t shatter or warp under stress. The nibs are made from dense nylon fibers that retain paint and allow for continuous, flowing lines. 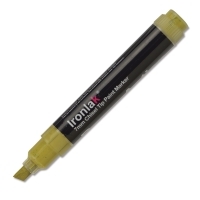 Ironlak Pump Action Paint Markers are available in a variety of nib sizes, from 1 mm to 15 mm. The 7 mm size is a chisel tip. All other sizes have a bullet tip. Ironlak Pump Action Paint Markers are fully compatible with both Ironlak Spray Paint and Sugar Artists’ Acrylic Spray Paint. Mix, match, and create mixed media masterpieces with confidence. ® Ironlak is a registered trademark.